Diagrams and clear explanations explain the use and form of the 24 best-known historic styles of garden design in the west. The period covered extends from the temples and courtyards of Ancient Egypt to the Modern and Postmodern styles of the 21st century, including recent gardens from the Chelsea Flower Show. 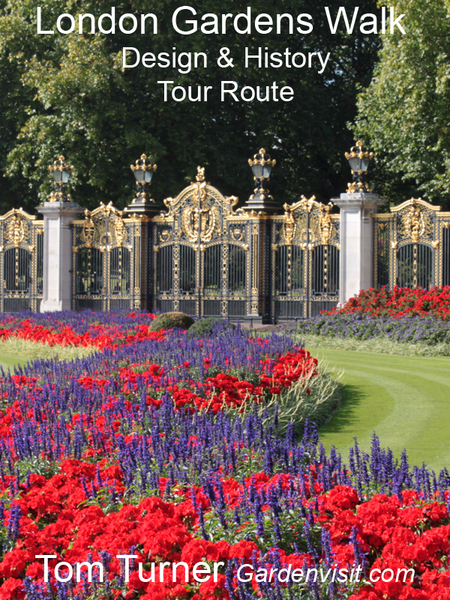 London is the world's garden capital and this is walkers guide to (1) gardens, parks and landscapes in Central London (2) garden-related exhibits in the British Museum (3) the history of Western garden design from prehistoric times to the present day. The list of London gardens to visit is linked to garden descriptions on the Gardenvisit.com website, which Tom Turner edits. CONTENTS: (1) Context-sensitive landscape architecture (2) Aims of landscape architecture (3) Theory in landscape architecture (4) Ten historic design theories (5) Mo, PoMo and PoPoMo Art (6) Modern Design Theory, including Ecological Design and Geodesign (7) Postmodern Design Theory, including Deconstructionism and Landscape Urbanism (8) Post-postmodern Design Theory, including PAKILDA and Ecological Urbanism (9) On Values, including McHarg, Land Ethics and Environmental Ethics (10) LANDSCAPE ARCHITECTURE MANIFESTO. 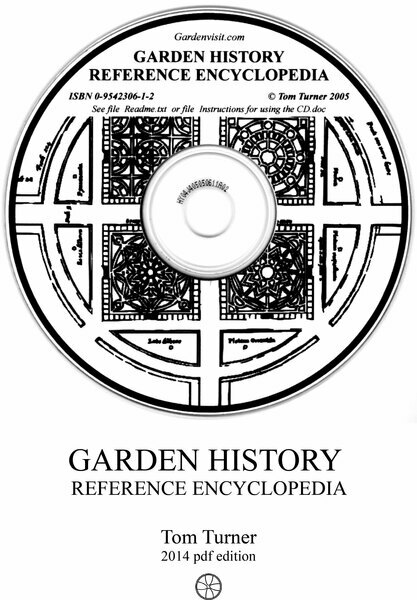 The Garden History Reference Encyclopedia is in Adobe pdf format with over 10,000 hyperlinks both internal and external, to sites of garden history interest. The text is twice as long as the Bible and is fully searchable using the free Adobe Reader found on must computers. For full details of the contents please see GHRE page on Gardenvisit.com. The Enclycopedia was available as a CD 2002-12 and is now offered as a pdf file. 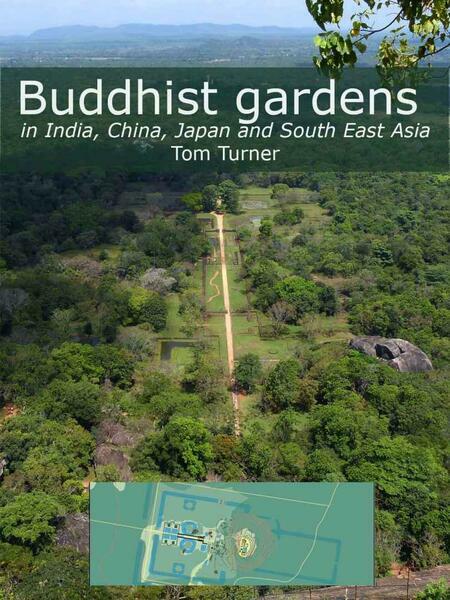 Buddhist gardens originated in India and spread, with Buddhism, to China, Japan and other parts of SE Asia. Buddhism was a major influence on the development of Chinese and Japanese gardens. Historians tend to recognize this in Japan but to ignore the influence of Buddhism on Chinese gardens, for what seem to be political reasons. 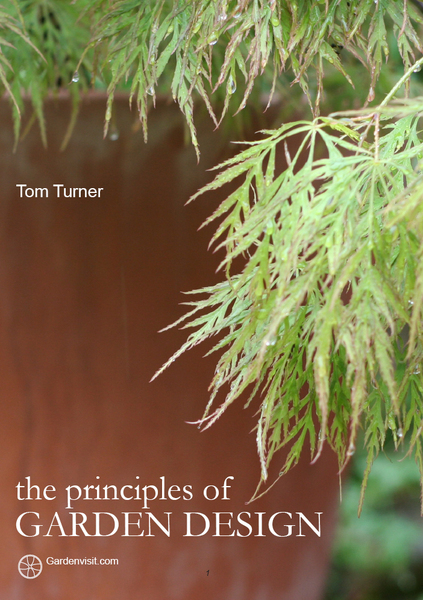 This eBook explains the 3 classic principles of garden design: (1) gardens should be useful, (2) gardens should be well-made (3) gardens should be beautiful. The principles derive from Vitruvius. They have influenced the design of gardens since ancient times and are as important today as they have always been. 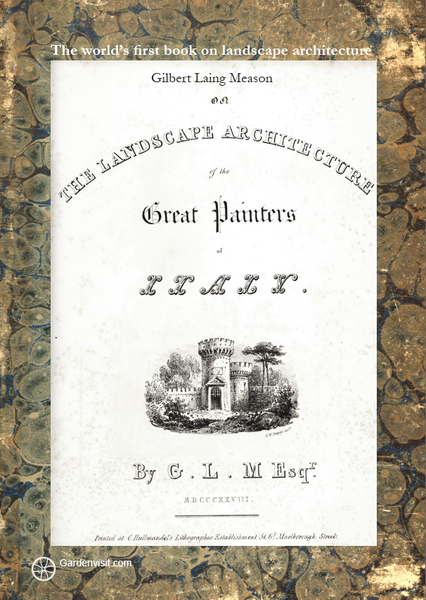 A critical account of the design methods used by landscape architects since c1860. They are classified as Modern, Postmodern and Post-postmodern. 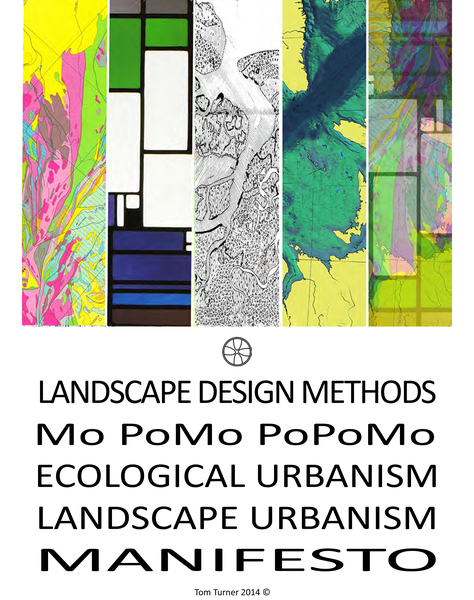 As illustrated on the cover, they include craft design, design-by-drawing, Survey-Analysis-Design, Landscape Urbanism, Geodesign and Ecological Urbanism. 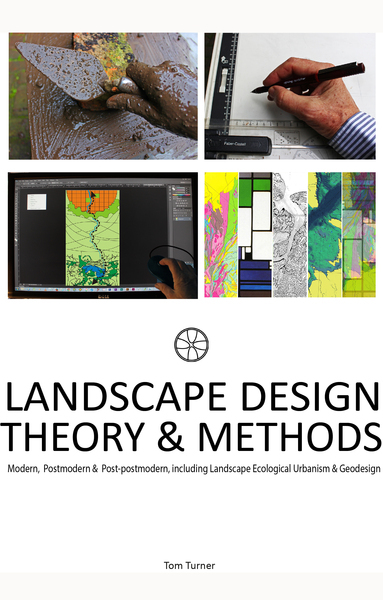 Digrams showing these methods are included in the companion pdf Landscape Design Methods Illustrated. This is the first English translation of Marie-Luise Gothein's classic Indische Garten (1926). 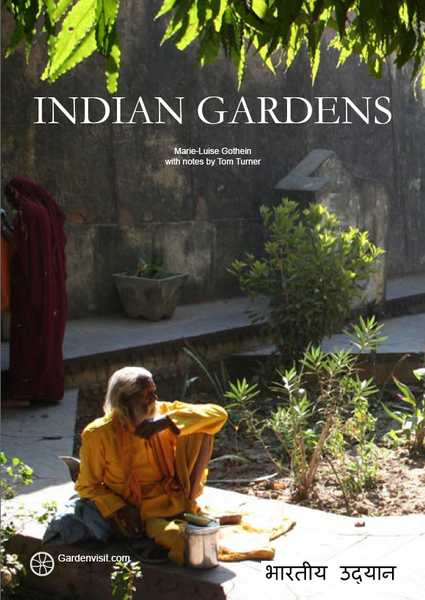 It is a real work of scholarship and a much more extensive treatment of Indian gardens than in her monumental History of Garden Art. Gothein learnt Sanskrit in order to research the subject. 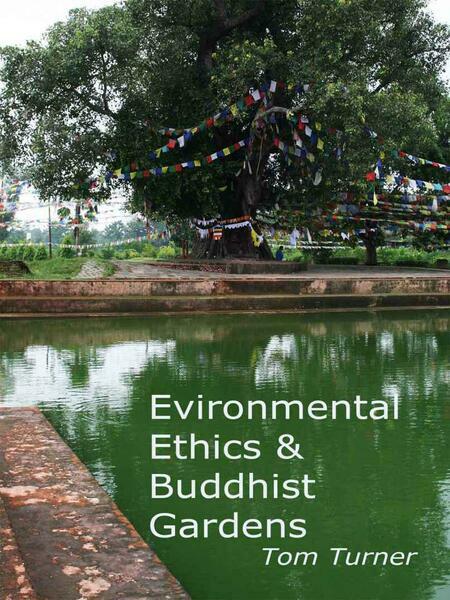 Buddhism has been a major influence on garden design - and Buddhist gardens can contribute to the development of the environmental ethic which is being called Green Buddhism, Environmental Buddhism and Eco-Buddhism. Gardens had a prominent place in the Buddha's life and his teaching influenced the making of gardens in the Indian subcontinent, China, Korea, Japan and much of south and east Asia. How to visit the world’s most interesting gardens in the best weather is the subject of this eBook. It contains advice and an anthology of some 100 gardens - including temple gardens, palace gardens, tomb gardens and botanic gardens. 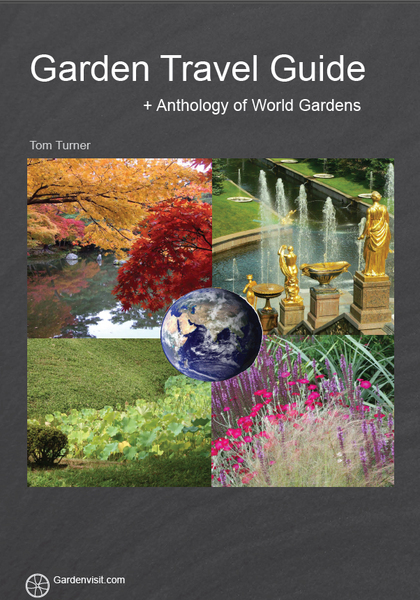 A ‘World Garden’ is one which represents a significant aspect of the world’s garden culture. 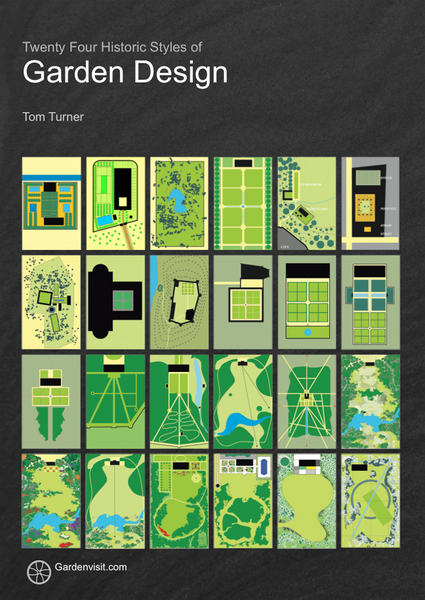 This book contains the chapter and illustrations with which Meason explains his conception of 'Landscape Architecture'. The term was adopted by Loudon, Downing, Vaux, Olmsted and the landscape architecture profession worldwide. The illustrations are engravings of paintings by Giorgioni, Breemberg, Veronese, Mantegna, Julio Romano, Siciolante Da Sermoneta, Giotto and Poussin. 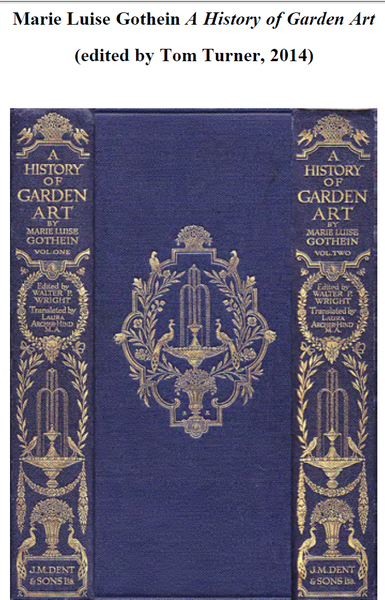 Marie-Luise Gothein (1863-1931) published her excellent history of garden design in German in 1913. It was re-published in English in 1928. This edition (first published in 2002) has been edited and revised by Tom Turner - who remarked that travelling to visit gardens for his own books on garden history was often a case of 'following Gothein's footsteps'. 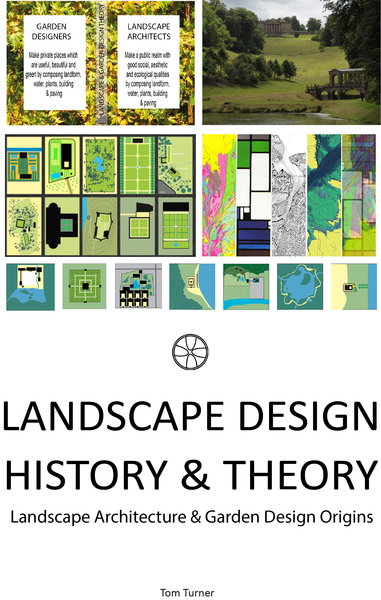 The use of design theories and manifestos by landscape architects in the modern, postmodern and post-postmodern periods is reviewed in the light of Hohmann and Langhorst’s statement that landscape architecture has 'no historiography, no formal theory, no definition, direction, or focus'. 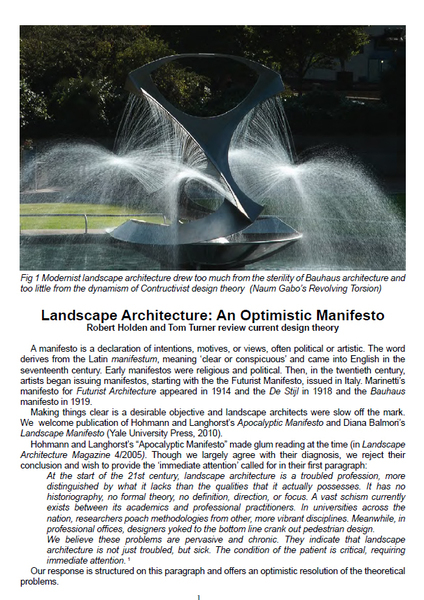 The author's response to this 'apocalyptic' proclamation leads to an Optimistic Manifesto for Landscape Architecture.